On Sunday, April 09, 2017, the Man Cup’s Exoticycle/Roaring Toyz event finished up racing in the evening hours, on time, with many a happy face generated by the weekend’s events. 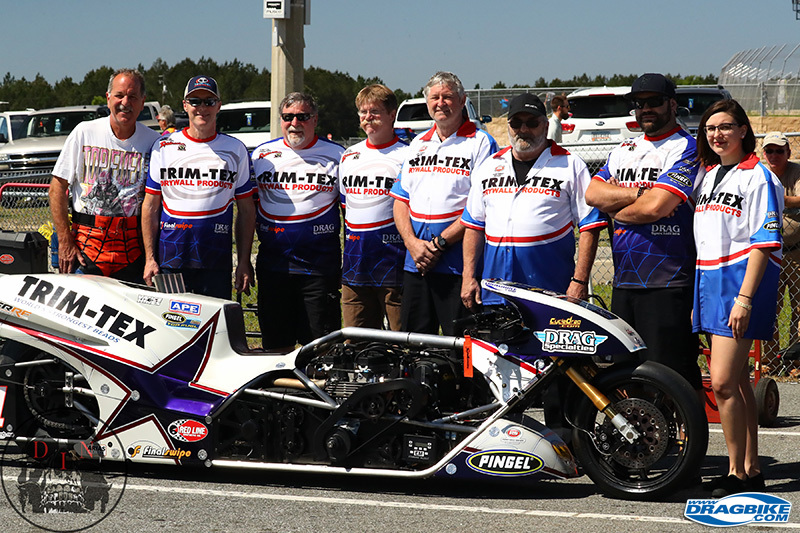 Three straight days of motorcycle drag racing featuring Top Fuel motorcycles, little to no downtime, solid smooth flowing organization and bright sunshine equal happy racers and happy campers. Due to a storm front that blew through earlier in the week; windy conditions kept racers on their toes a bit during Friday qualifying, but for the remainder of the weekend, weather was not a concern. The lack of downtime and well-run staging lanes gave the race an excellent tempo, start to finish. Every day’s racing wrapped up on time, well ahead of curfew. On Sunday, the race was done before dinner time and Larry McBride was a happy man. In the Pingel Top Fuel class, there was a ton of anticipation with the playing of the National Anthem as the first pair out was Ian King of the UK Vs Dave Vantine of NY, USA. As the notes of the Star-Spangled Banner faded off, Ian King fired up first and he was set for battle as both Dave and Ian are both official members of the MTC 5 Second club. The crowd was ready and the stage was set for some good drag racing of the highest order. As the racers staged, when the lights flickered from amber to double green, Dave Vantine was away first with a .078 RT to Ian’s .093 and they had a heck of drag race in progress at the start, till the Gulf Oil team’s motorcycle broke traction in the left lane. Ian had a solid launch from the start, but about a bike length out of gate, his rear tire just went up in smoke and so did his teams racing efforts for the weekend. 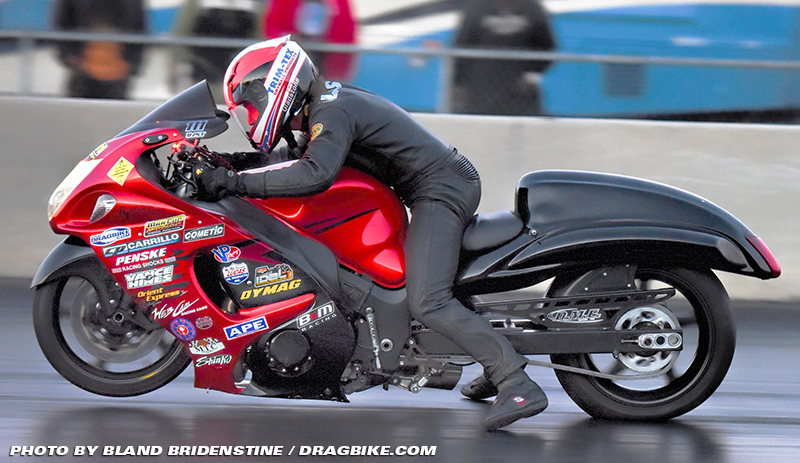 Dave Vantine was off on a 6.07 elapsed time at 232 MPH and this sent Dave on to round two. Sam Wills then matched up with Mitch Brown driving Dennis Bradley’s new T/F bike and their match up was brief. Mitch’s bike developed a problem and Sam ended up with a competition single that launched him into the semi-finals. 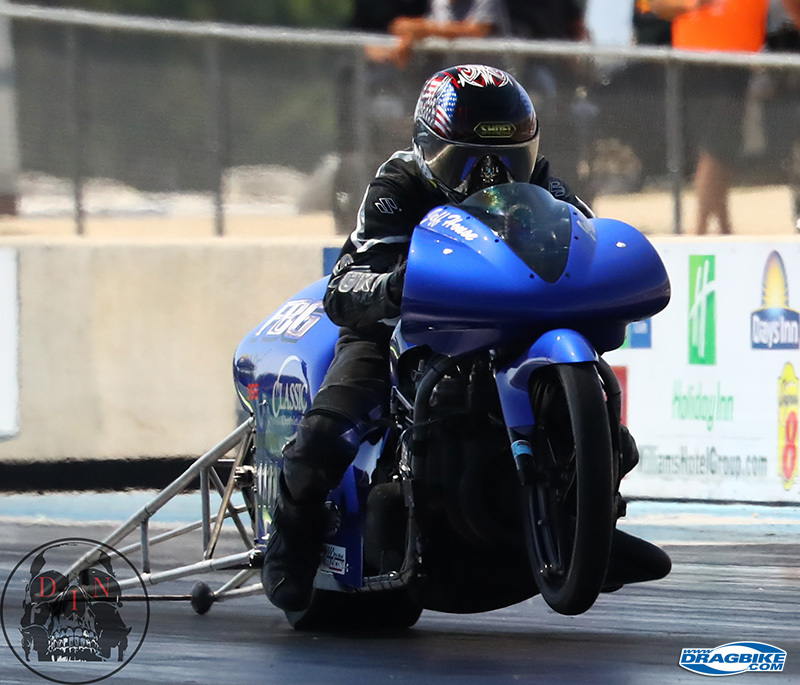 Larry McBride, as low qualifier, had a bye run and Larry unleashed a 5.91 @ 238 to let the rest of the T/F bike field know he was not playing this weekend. 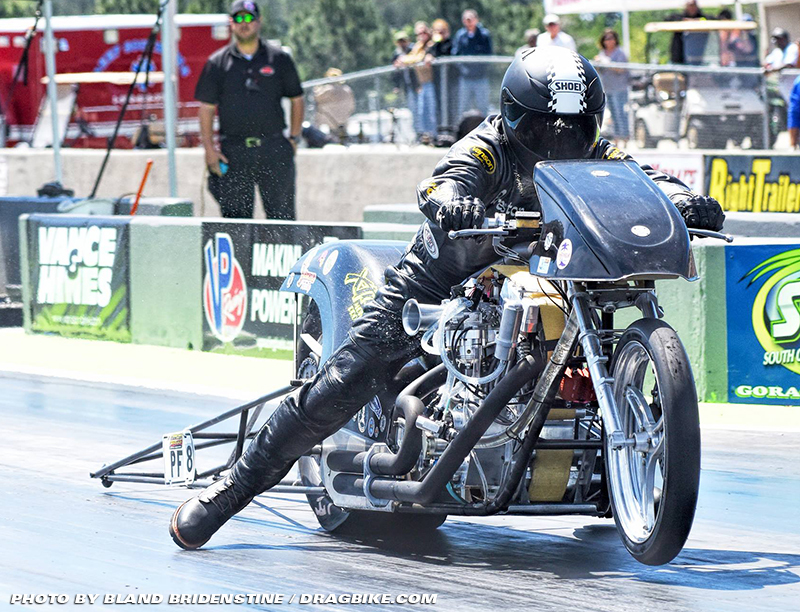 In E-2, Sam had the bye run and he laid down a fine 6.02 @ 225 MPH, putting on a great show for the fans in the process. 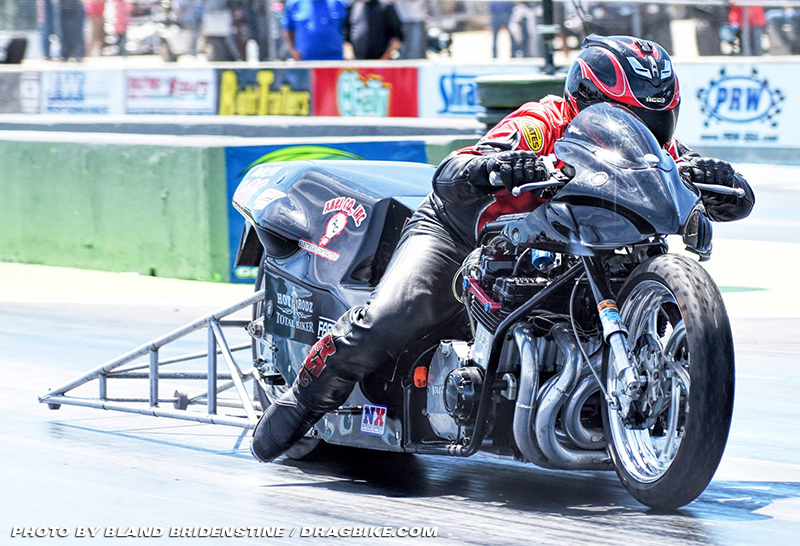 Larry and Dave Vantine then upped the showmanship quotient by running side by side 6.0’s for the fuel bike faithful. Larry’s .050 RT to Dave’s .058 had them leaving the line together and they stayed wheel to wheel down the track with Larry winning the round 6.044 to Dave’s 6.069: What a drag race! 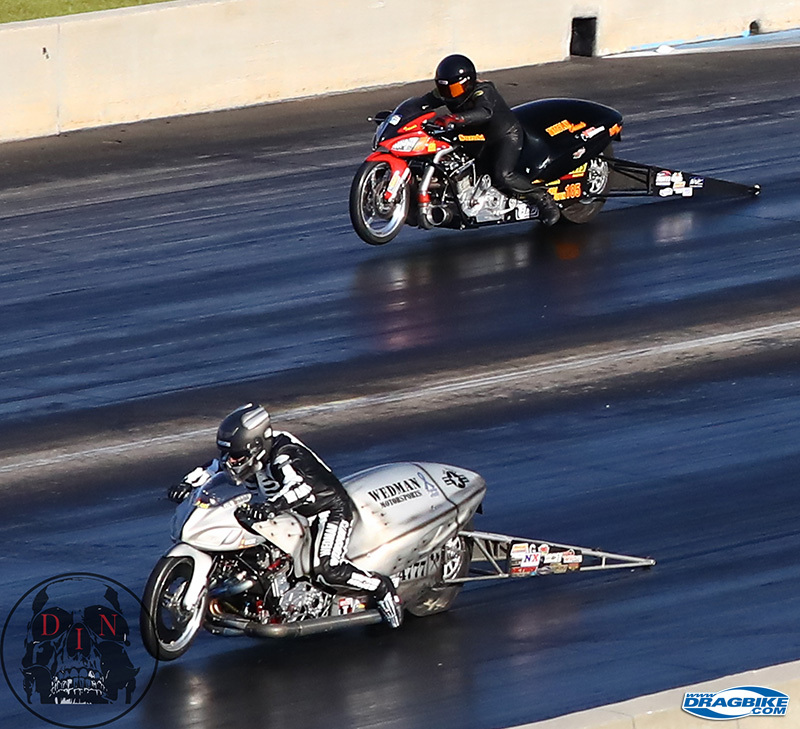 In the final round, Larry and Sam matched up, same as they did to start off the 2016 season, just one year ago – again – the two old friends met in the final round to start off a new year of racing. But this time the outcome of their racing was different from last year. Twelve months ago Sam won the drag race, this time Sam lost the drag race. He went red by .001 of a second and that was it, game over. Yet the two stayed side by side for 1320 feet of race track. Larry’s 6.23 was very close to Sam’s 6.13 elapsed time and in the end, it was handshakes, hugs and back slaps that mattered most. Larry and Sam have been fuel racing each other since the 1970’s and they’re still two of the best to zip up leather suits. 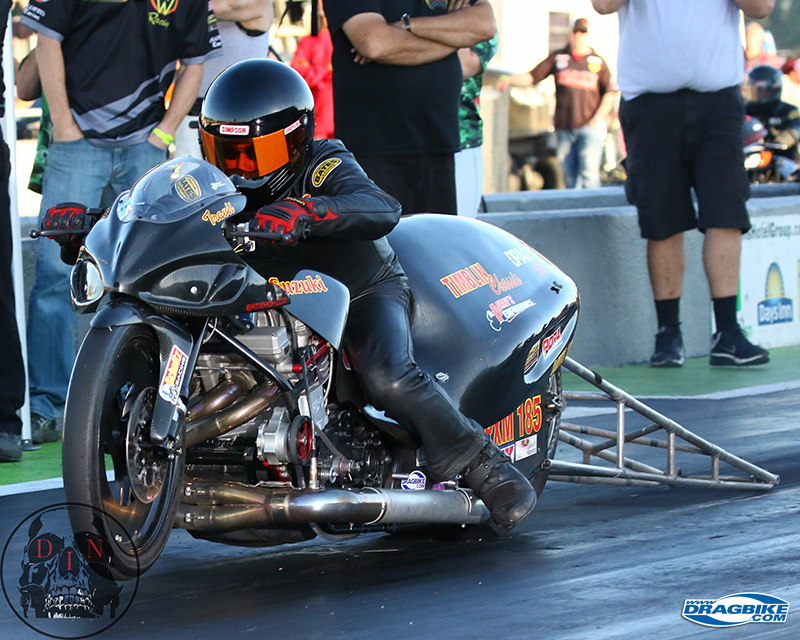 In Hawaya Pro Fuel class eliminations, with a three-bike entry field, Michel Ray lead things off with a solo pass of 7.061 @ 174.93 mph. 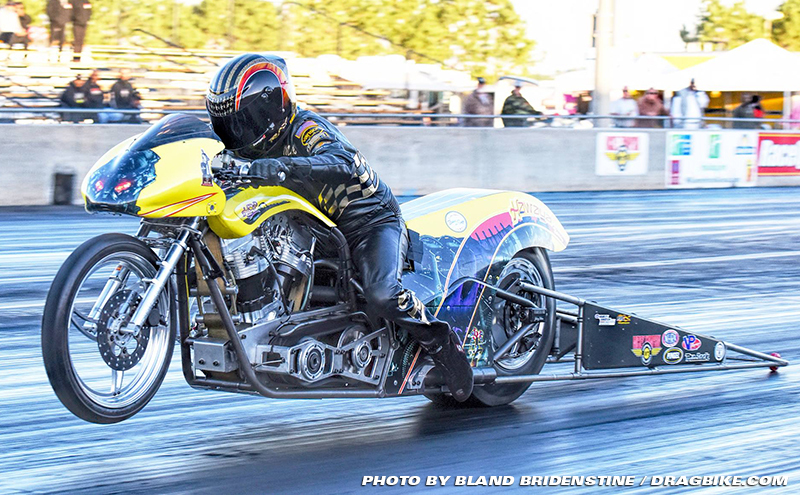 He’s been running 7-Oh’s now since last November at the Man Cup World Finals when he and Kirby Apathy both traded punches over who was going to either set the new world record – and/or be the first to run a 6 second elapsed time with a Pro Fuel bike. 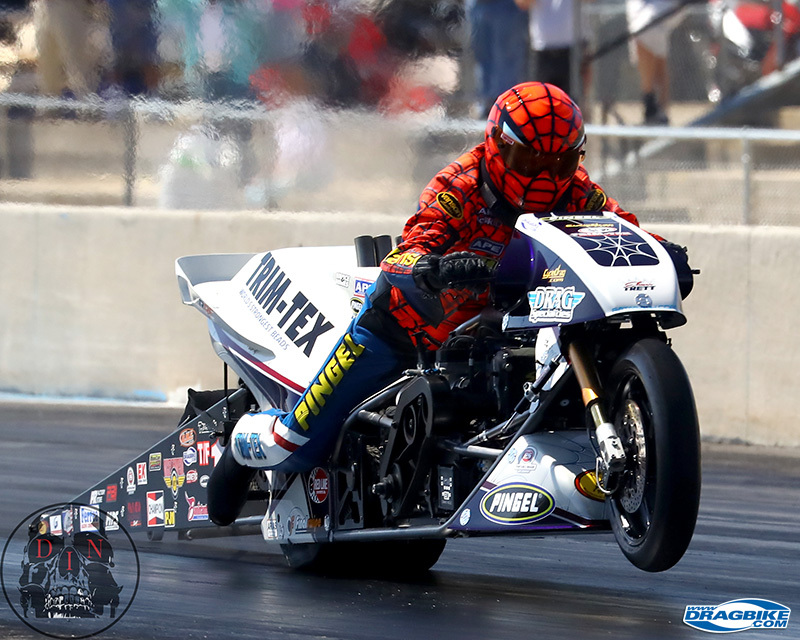 While it was painful for Kirby to not be racing this weekend, it was even more so for him to have to watch the Terminator bike skirting the edge of the six-second zone while his own P/F bike awaits custom parts. Hopefully by the June Man Cup event in Memphis, Kirby will be able to give Michael Ray and Johnny Vickers some company. After Michael’s 7-0n show, Preston Bartlett and Rocky Jackson stepped up to the plate to swing for the fence, and see who would face “The Terminator” in the final round. Rocky got out first on Preston, .098 to .139 and Rocky looked for a moment like he was going to run away with it, but his motor did not sound right by half-track and Preston leapt ahead. At the stripe, Preston Bartlett’s 7.30 to Rocky’s 7.53 was a win for Preston, his first of 2017. In the final round match up, Preston got out on Michael first with a .125 RT to Mr. Ray’s .159, and then Johnny Vickers Terminator bike just came on like a freight train. Ray pulled away at half-track and just kept truck’n. The scoreboards showed 7.55 for Preston Bartlett and a 7.011 for Michael ‘7-0’ Ray. 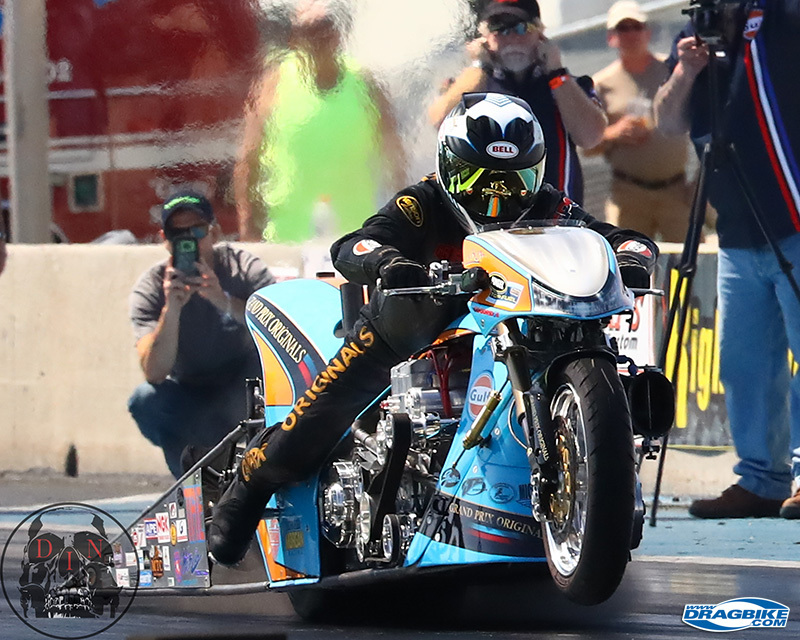 In the Falicon Pro Mod racing class eliminations, it was the Travis Davis show featuring Jeff House as they tore through the 12 bike field to meet up in the final round. Travis eliminated Charlie Prophit, Paul Gast, and soloed into the last round. Jeff House eliminated Rick Perry, Brad McCoy and Brunson Grothus to earn his first final round match-up of 2017. Together they put on a hell of a drag race for the final round. Travis was out first with a .038 RT, but Jeff House was not far off with his .041 light. They tore through the 1/8 mile course with elapsed times of 4.11 for House and 4.05 for Travis Davis who won his first Falicon Pro Mod event of the year. In Nitrous Express Pro Open class action, Mr. Paint, AKA Mark Rendeluk continued his winning ways by once again laying low the entire field with Chris Wedman horsepower (and great consistency). Why fuel Harleys that need to test and tune don’t run in this class is beyond me. They can’t rent a race track and test on one for the price it would cost them to run in P/O. 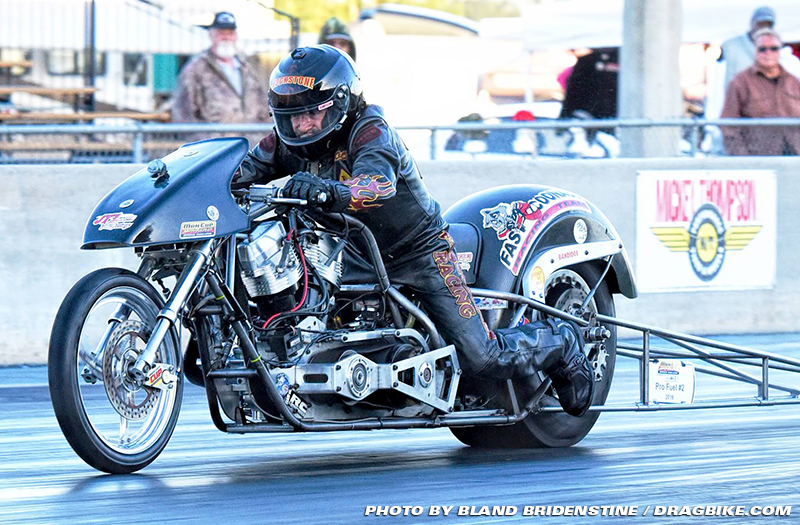 There are a TON of old Nitro Harleys out there that once ran in AHDRA P/F class that can run and do well in this class. I hope to see some one day. Rodney was low qualifier for the event and looked like a win waiting to happen till he got a little too close to the razors edge in round E-3. 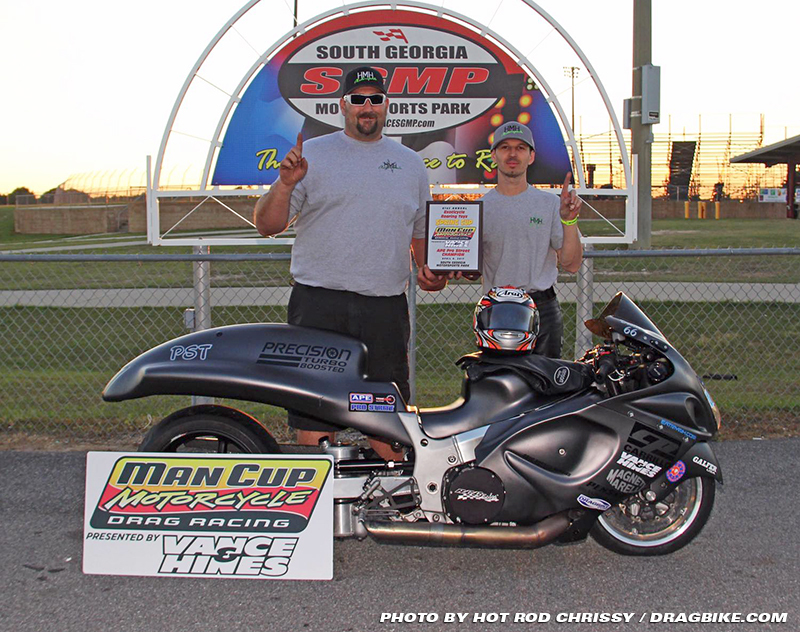 There he was matched up with Jeremey Teasley, who’s now the top gun for DME/Pro Stock Inc. Team, and Rodney went red by .003, sending Teasley to the final round. Despite the loss, a big 226 mph number came up on the board on that 6.80 pass, giving the Williford lane something to celebrate. CLICK HERE TO WATCH RUN. 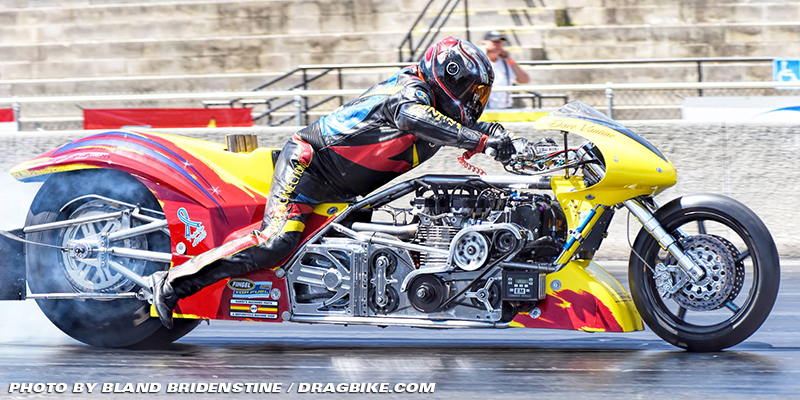 Ehren Litten, Rodney’s teammate, went through the field just as Rodney did and in E-3, Ehren was eliminated by Justin Doucet, 6.80 to 6.81 – it was the .063 reaction time of Justin Doucet to Ehren’s .066, that earned Doucet his shot at the big time…and he made good on it! 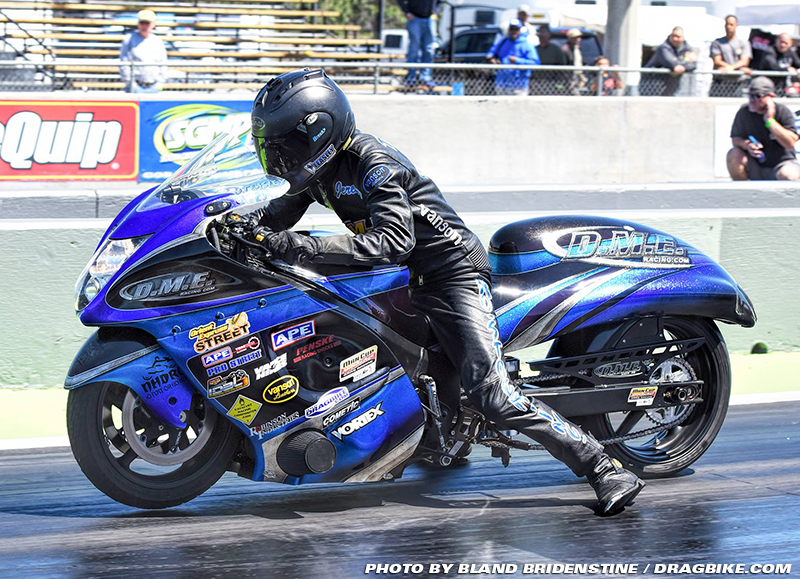 Justin’s final round 6.85 @ 210 MPH was his ticket to the winner’s circle as Jeremy Teasley slowed well before the finish line, handing Justin his first hard earned win of the season. Just two weeks prior Justin had a great outing at another race and this may be his year, he’s off to a great start! 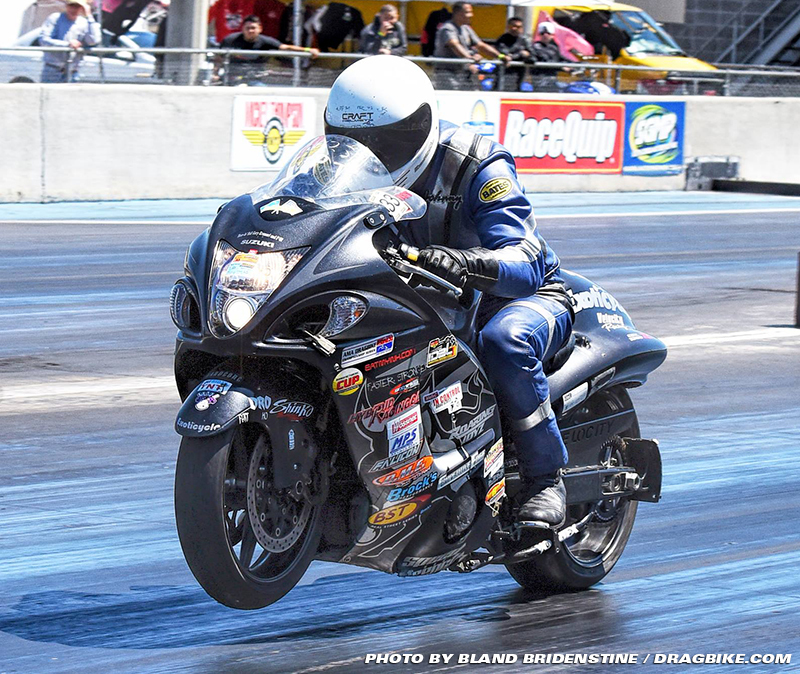 Shinko/WPS Real Street racing, with eight bikes entered, was led by Joey Gladstone who qualified #1 with a 7.76 elapsed time. He was matched up with Troy Jackson for E-1, but Troy broke and could not make the call. 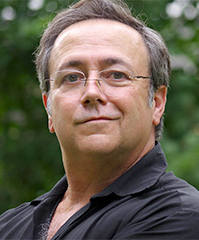 In E-2, Joey faced off with Louis Hornedo. Joey’s 7.79 was too much for Luis who posted an 8.0 number on the scoreboard that sent Joey on to the finals. There he met Johnny Dobrin who gave Joey a driving lesson he won’t soon forget. Johnny’s .031 RT to Joey’s .089 was way too big a margin of error to give up early in the race. 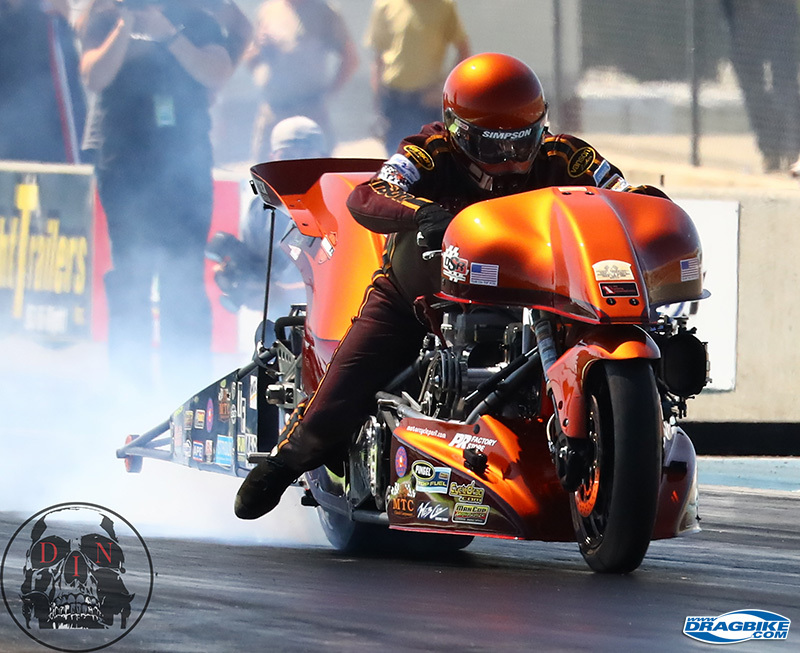 Dobrin then stormed on to a 7.75 win over Joey Gladstone’s 7.84 for Johnny’s first W of the season in Real Street. The Next Race for the Man Cup Series in June, 2-4 in Memphis, TN, for the Summer Nationals. 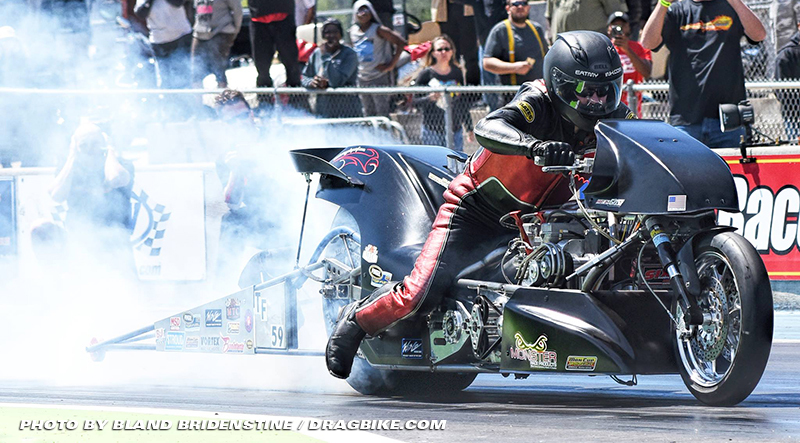 Sportsman Series coverage by Dragbike.com will be up later this week. 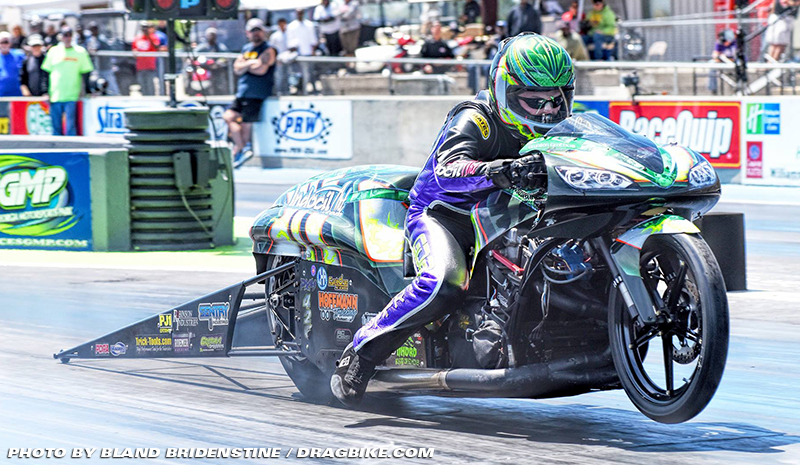 A big thank you to all from us at Dragbike.com for helping us cover this race. 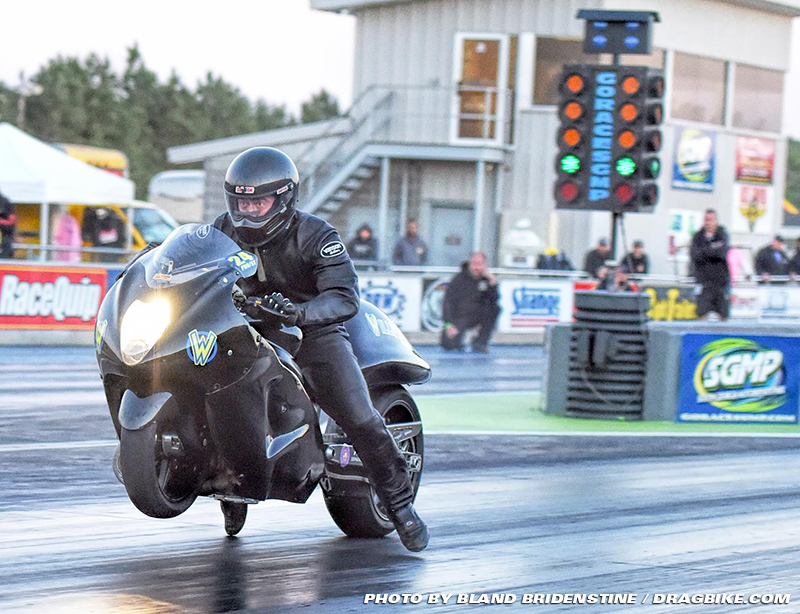 While SGMP is still recovering from the tornado that hit the facility this past winter, reporters from Dragbike.com had no workstations to work out of for this race. The racers took up the slack, with help from the leaders of Man Cup, and we all got the job done: THANK YOU! !